Yours truly appears on page 12 of the new book ‘The Good Luck Girls of Shipwreck Lane’ by Kelly Harms. Well, sort of. What happens when you Google yourself? It’s a fun exercise that does little to reveal what people are saying about you (unless you’re Kim Kardashian) but sometimes you find other people with the same name or nickname as you — in real life or in fiction. Geoff “DeafGeoff” Herbert is a former radio guy turned entertainment reporter for The Post-Standard and syracuse.com. I also work as a DJ, motivational speaker and dabble in writing independently. But if you search for my name on the Internet, you’ll also find a British politician named Geoff Herbert, an IMDb page for a Geoff Herbert who worked as a rigging key grip for The Hunger Games, and a “Deaf Geoff” Garbage Pail Kids trading card. There also was a “Deaf Jeff” in Arliss Howard’s 1988 movie Plain Clothes and a late ’80s rapper named Def Jef, who found better success as a producer for artists like Nas, 2 Pac, Snoop Dogg and Shaq. 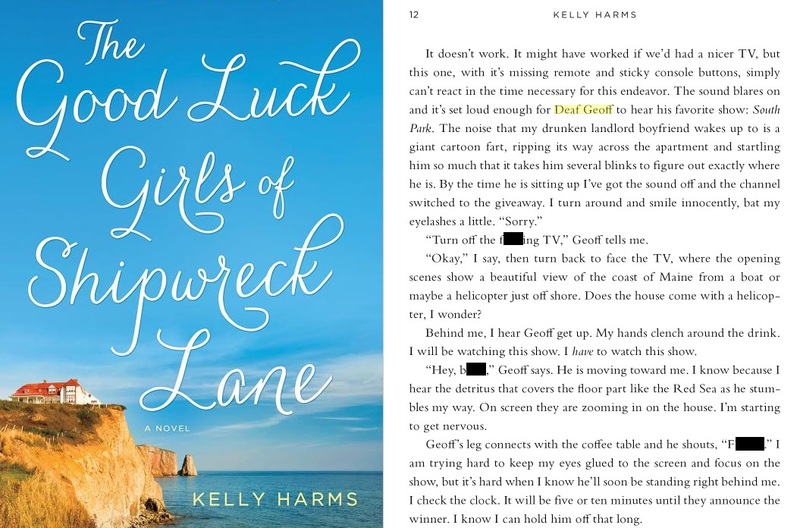 Now there’s a “Deaf Geoff” in a new book called “The Good Luck Girls of Shipwreck Lane” by Kelly Harms. Published in summer 2013, it’s the debut novel from a Madison, Wisconsin, resident who previously worked as an editor and agent. A Google preview of the story’s first 30 pages reveals one of the “Girls” is living with her boyfriend Geoff, who’s a bit of a drunk slob who watches TV too loudly because he’s losing his hearing playing in a band. His favorite TV show is “South Park” and he’s painted as a jerk who Nean is waiting to leave as soon as she wins a contest for a house in New England. As much as I got a kick out of seeing my nickname in print, I doubt I’ll buy/read the book as it seems to be targeted towards the same readers of “The Sisterhood of the Traveling Pants” or “The Divine Secrets of the Ya-Ya Sisterhood.” I also doubt I can relate to my namesake character, who likely won’t make it to the final chapter, as I was born mostly deaf, I rarely drink and I would watch reruns of “Seinfeld” over “South Park” any day. But still, it’s fun to occasionally Google yourself and see what comes up. What’s the weirdest thing you’ve found when searching for your name?